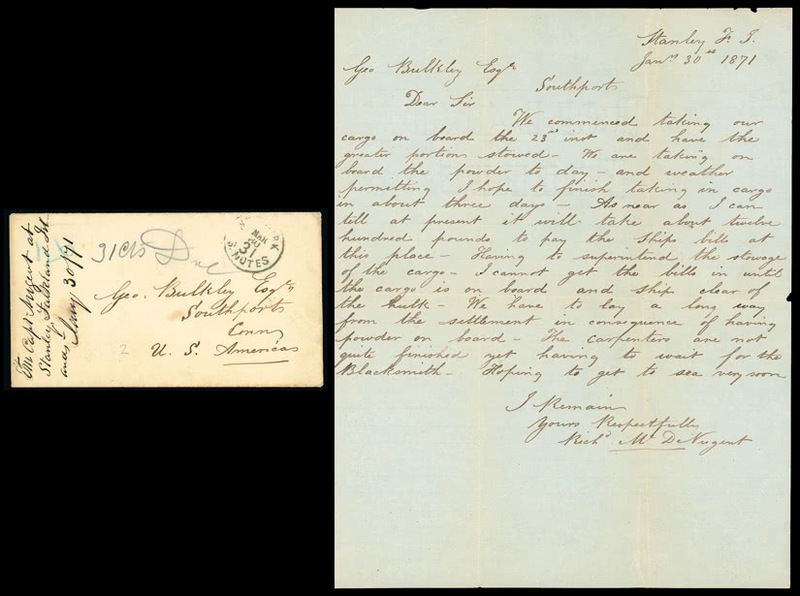 Star item in the exceptional collection of Antarctica formed by the late Fred Goldberg was the 1911 Roald Amundsen expedition envelope (lot 1163, left), the only known example to have travelled to Antarctica and sent on the return of the ship “Fram”. Determined bidders forced the price upward to £19,220. 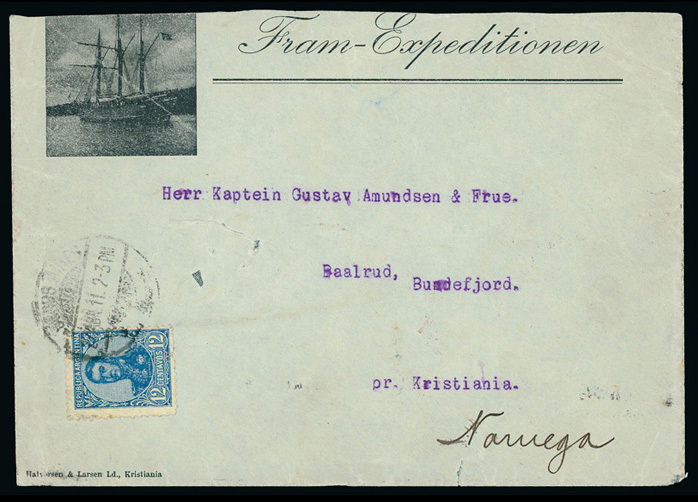 From the British National Expedition of 1901-04 and featured on the front cover of the auction catalogue, an attractive envelope addressed by Capt. 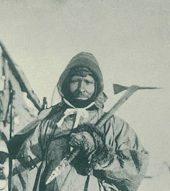 Scott and bearing the “NATIONAL ANTARCTIC EXPEDITION” label (lot 1139) climbed to £6,820. 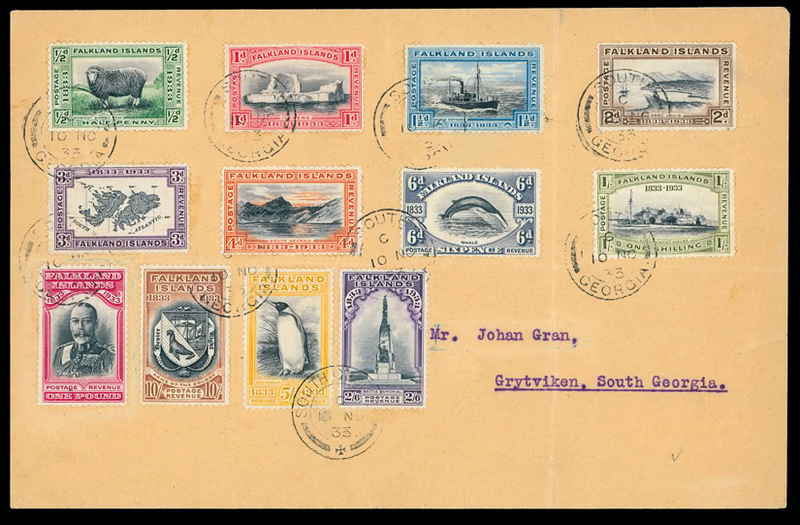 This collection was part of a strong offering of Falkland Islands & Antarctica that also featured the ‘Braemar’ Collection of Falkland Islands. 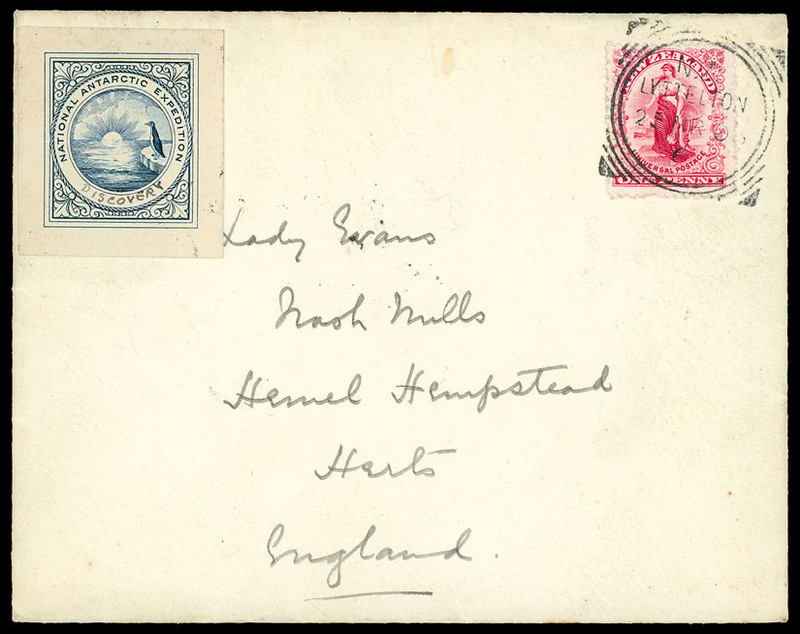 Amongst a number of significant results in this section were the £6,820 paid for a scarce item of early mail from the islands, sent in 1871 to Connecticut (lot 776), postal history remaining a growth area, and the £2,852 paid for the 1933 Centenary set on cover from South Georgia (lot 1062), which possibly reflects a view that catalogue prices for issues ‘Used in Dependencies’ have become overinflated. 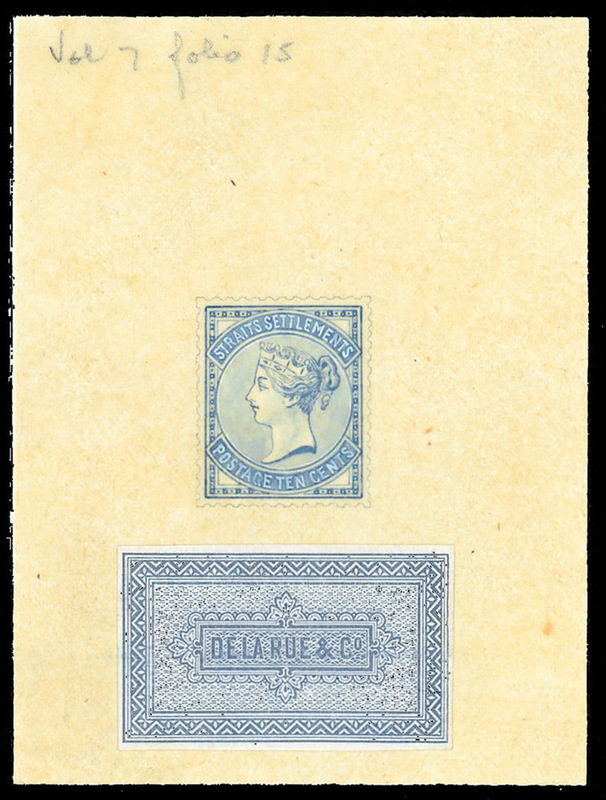 De La Rue Essays and Proofs from the remarkable collection formed by Dr. Peter Young received in almost all cases an enthusiastic response. These included the handsome Malaya 1881 “STRAITS SETTLEMENTS” essay (lot 65) that achieved £4,800 and the 1890 “BRITISH/SOUTH AFRICA/COMPANY” trial overprint (lot 641, left), a great rarity and an intriguing record that the first Rhodesia issue might have been a Great Britain overprint, which rose impressively to £11,040. Other notable prices in this auction included those for the Nauru 1916-23 10s. 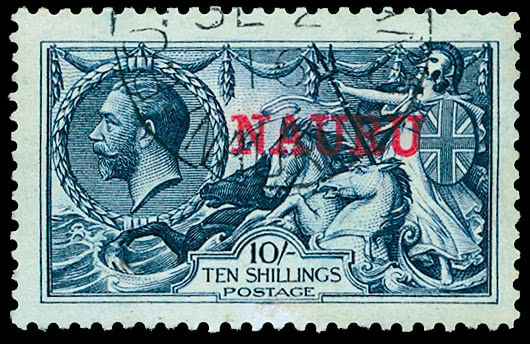 indigo-blue (S.G. 18, lot 585) which reached £2,430 despite a small surface rub at foot, New Guinea “G.R.I.” 8d. 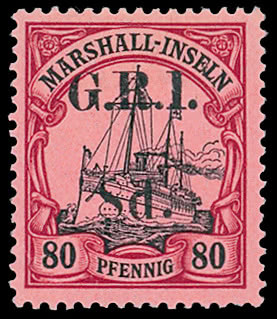 on Marshall islands 80pf. 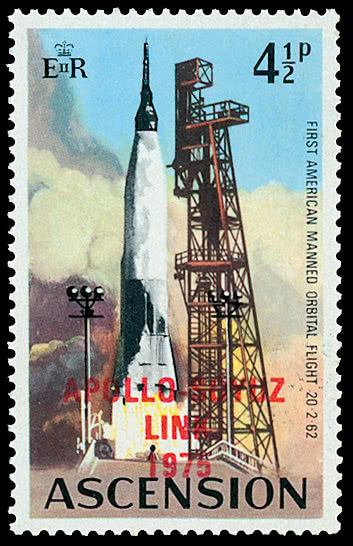 (S.G. 64m, lot 590) that rose to £4,200 and the £1,364 achieved on the first offering of the recently discovered Ascension variety, the 1975 Apollo-Soyuz Link 41/2p. with overprint in red rather than black (lot 157). Closing Grosvenor’s Autumn 2017 Season, this attractive one-day sale formed a pleasing overall realisation of £517,921. No firm indicators can be seen for the future of the market except to note the continuing trend away from basic stamps and toward covers and postal history. Things are hotting up also for essay/proof material. 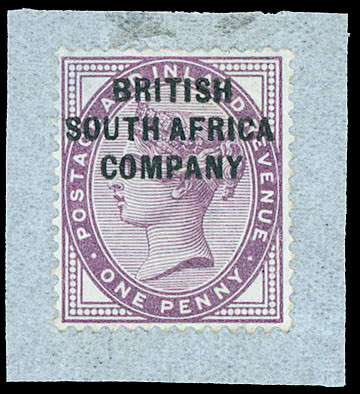 Many collectors today have greater interest in filling their albums with rare or unique individual items rather than merely ‘completing’ their collection of the stamps of a particular country.